Each luggage tag favor measures 4" x 2.5". Aqua blue rubberized luggage tag in the playful and fun shape of a flip flop, complete with a modern white bubble patterned design and a blue strap with an adorable starfish embellishment at its center. The back of the flip flop has a clear plastic window-covered slot for the easy insertion of the included blank luggage tag once your guests' fill them out. Blank tag has fields to be completed for Name, Address and Telephone Number. 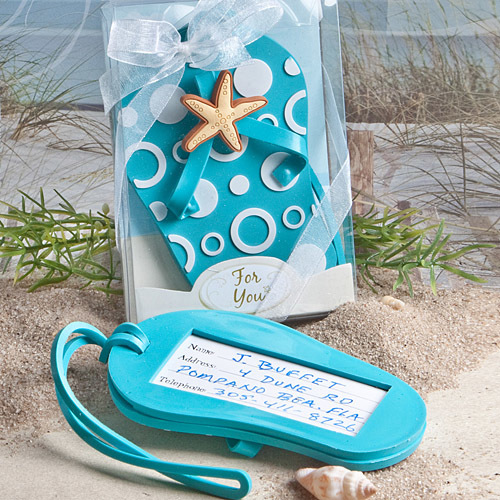 Packaged atop a beach and ocean themed insert in a clear box, wrapped and tied with a white organza ribbon, finished with a "For You" message on the package. Please allow 4 business days to fulfill order; then add shipping time from NY.